Any fans of this wonderful lyric soprano? The orchestra is also wonderful. I love her singing Mozart (aside from a set of arias I have her in Cosi and it is great! ), she also did a fantastic version of Barber's Knoxville. A really a beautiful voice. She was a lovely Elsa in the first complete opera recording I ever bought, the 1953 Bayreuth Lohengrin, with Windgassen, Varnay, and Uhde, Keilberth conducting. 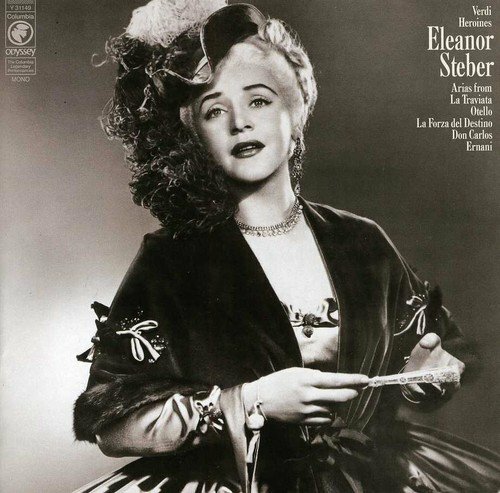 She's also wonderful in the RCA "original cast" recording of Barber's Vanessa. I have always admired her Mozart and her recordings of Barber's "Knoxville, Summer 1915," which she commissioned. I like the orchestral version better, more colorful than with piano accompaniment, sung by Leontyne Price, also more narrative and less operatic. Well, there is vibrato here and there in the Price recording but that is inevitable. A completely vibrato-less tone is usually a forced one. In this piece I do believe that word trumps tone. I've always loved Steber's version of Berlioz's Les Nuits d'Ete (conducted by Dimitri Mitropoulos). The eminent Berlioz scholar, David Cairns, gives it the highest recommendation in Alan Blyth's Song on Record, and for me it rivals Janet Baker's superb versions with Barbirolli and Giulini, which from me is high praise indeed. Her recording of Depuis le jour from Louise is almost in the Callas class for nuance and shading (and a good deal more securely sung). She is also very fine in the complete recording of Barber's Vanessa. Yes, a great and sadly underrated singer. Sure, Callas herself used that childlike tone in Butterfly where she is being asked her age. I'd look at the issue, though, a little differently. In this instance, she emphasizes the higher overtones that seem vibrato-less. I am personally wary of manipulating vibrations in voice. More "narrative" to me, is less legato. Popular music as a rule doesn't need nor ask for the full range of overtones. Haha - In Steber's recording of Knoxville she rushes the line "people in pairs, not in a hurry" !! My personal favourite recording of this work (Of the 12 versions I've heard) is Karina Gauvin on Naxos. She just judges it perfectly, so intelligently and unnaffectedly sung, and such a beautiful voice. She was excellent Minnie in La fanciulla del West, from Firenze under Mitropoulos. Haha - In Steber's recording of Knoxville she rushes the line "people in pairs, not in a hurry" !! I guess you assume irony is beyond her ken. Personally, I thought Guido's "Haha" was not derogatory but amused. But let's see what he says. It was in amusement, and I'm sure she intended it, though I don't see why given that the text doesn't seem to be ironic in this section. I find her Elsa unsurpassed, at least in post-war productions. Arias from "Ernani", "Don Carlo", "La forza del destino" and "La Traviata", as well as nearly half an hour from "Otello" (with Ramón Vinay).